Cystic echinococcosis (CE), caused by larval stages of the tapeworm Echinococcus granulosus, is one of the most important zoonoses distributed worldwide. 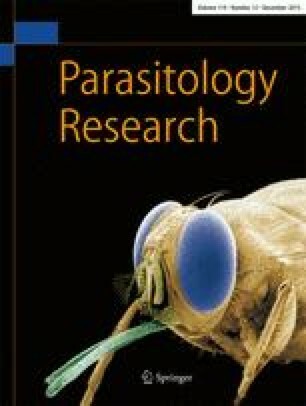 Genotype analysis of the parasite isolates from various hosts is required to better understand the host specificity and transmission routes. The aim of this study was to identify the genotypes of E. granulosus isolated from humans and domestic animals from northwest of Iran (Zanjan Province) using the mitochondrial cox1 gene sequence. A total of 86 hydatid cysts including 49 sheep and 28 cattle isolates from the slaughterhouse and nine human isolates from surgical wards of local hospitals were collected. The isolates were subjected to DNA extraction, PCR amplification, and sequence. Eighty-two (95.35 %) isolates, including 47 sheep, 26 cattle, and all nine human isolates, were determined as G1 genotype, and the remaining four (4.65 %), including two sheep and two cattle isolates, were identified as G3 genotype. From the cox1 sequence data, 13 different haplotypes (10 G1s and three G3s) were detected and named as EGH1–EGH13 (GenBank accession numbers, KP859559–KP859571). EGH1 was the major variant among the haplotypes, and it was identified in 46 (53.49 %) isolates (31 sheep, 14 cattle, and one human). Alignment of the partial cox1 sequences showed 12 point mutations including seven (58.3 %) synonymous and five (41.7 %) non-synonymous substitutions. Based on the results, G1 was the major genotype of E. granulosus in northwest of Iran affecting sheep, cattle, and humans. In addition, a minor group of G3 genotype was found to be circulating in this region. The online version of this article (doi: 10.1007/s00436-015-4673-y) contains supplementary material, which is available to authorized users. This work was supported by a grant (no. A-10-95-1) from the Research Vice-Chancellery of Zanjan University of Medical Sciences (ZUMS). The authors would like to express their gratitude and appreciation to the staff working in the slaughterhouse and the operating rooms of the hospitals in Zanjan for their assistance in collecting the samples required for the study. Special thanks to Dr. Fasihi Harandi for his kind gift of the standard DNA strains as well as constructive comments. We would also like to extend our gratitude to Dr. Hassan Roknizadeh for his helpful comments in bioinformatics analysis. Last but not least, we would like to thank Dr. Mehrdad Pedram (Dept. of Medical Genetics and Molecular Medicine, ZUMS) for careful editing of the manuscript.